Answer: Most stars and constellations visible north of the equator were named by Arabian stargazers thousands of years ago. Those south of the equator were named by European explorers in the 15th century, when that half of the sky was first “officially” mapped. This was long before light pollution obscured the fainter stars. These days, only a few major constellations look like their namesakes — the fainter points of light are “missing” from the pictures. As a partial remedy, groups of stars that still look like something, called asterisms, have replaced many of the originals. 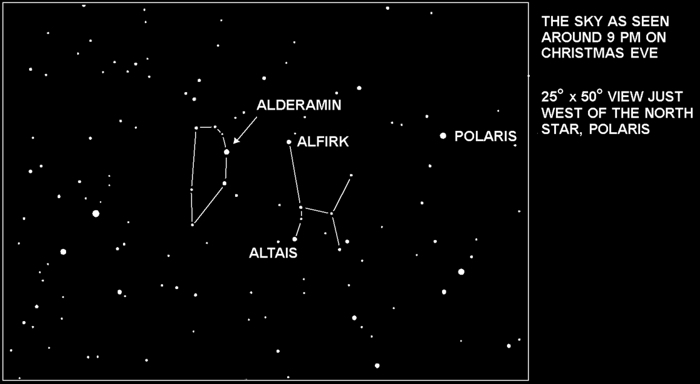 One example is the Big Dipper, which is only a fraction of the much larger constellation Ursa Major (The Great Bear). Anyone can make up their own asterisms since the names aren’t official. The whole point is … they help you find your way around the sky. Exercising my inherent rights as a stargazer, I hereby name the asterism DH, part of the constellation Cepheus, in memory of my father, Don Heim. On Christmas of 1963, he gave me my first telescope. I’ve been hooked on photonics ever since. Thanks a billion, Dad.